The Startup Mode affects the behavior of the Capture Agent at the time of its next restart. The default Startup Mode for the Capture Agent is Normal. Before changing the Startup Mode, the Capture Agent must be stopped. The Startup Modes are useful in situations where the source database is moved from a production system to a backup system ("fail-over") or where SQDR operations are restored on a primary server ("fall-back"). Both operations can be performed without the need for SQDR to run baseline replications. This option is termed a “Warm” startup mode. Another new startup option, “Cold” startup, will force all subscriptions to be flagged as requiring new baselines. This “Cold Start” option is useful when the host control tables are intact and in agreement with the SQDR client(s), but the User source and destination database tables are no longer be assumed to be synchronized. For example, this situation might occur in the event of unrecoverable log damage, necessitating a restore. Once the Capture Agent has completed the startup-time recovery, it resets the startup mode for the next invocation to “Normal”. 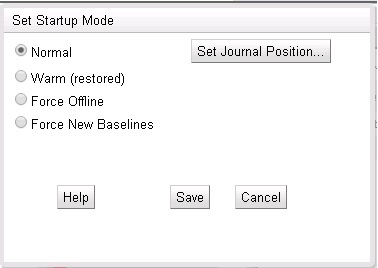 If the source is DB2 for i, there is also a button to Set Journal Start Position. SQDR Plus assumes that the state of its log, staging tables and log positions are still current and accurate. However, at startup, the Capture Agent checks for source table structure changes. The Startup Mode should be set to Normal except when a "fail-over" or "fall-back" operation is being performed. When selecting Warm or Offline startup modes for a DB2 for i agent, the “autoJournal” configuration setting will determine whether the agent will attempt to re-grant permissions that are normally given to the agent’s non-privileged user-id at “add subscription” time. The setting also controls whether the agent will automatically attempt to start journaling for subscribed physical files that are not (or no longer) journaled when the agent is started up in one of the recovery modes (Warm or Offline). SQDR Plus assumes that logging tables and staging tables are in a working state and that it only needs to recover the current log position. This option is useful when copying the entire SQDR Plus schema (e.g., library) to a new system, or other types of complete restore operations where the consistency of the database is guaranteed. SQDR Plus skips any journal entries showing that tables having been deleted and re-created by moving its log/journal read position to "now". As in a Normal startup, the Capture Agent validates source table structures. If auto-journaling is enabled and SQDR Plus discovers that a source table is no longer journaled, it will automatically try to restore journaling. Also, grants to the views on the staging tables are made to match the source tables. SQDR Plus makes no assumption about the consistency of log and staging tables. It skips any log/journal changes and takes all subscriptions "offline". The user can then manually move subscriptions "online" in a controlled fashion once SQDR Plus is restarted. Taking a subscription online will cause a new baseline replication to be required. (See Taking Subscriptions Offline/Online for more details). As with the Startup with fully recovered control and staging tables mode, metadata verification occurs, journaling is restored, if necessary, and grants to the views on the staging tables are made to match the source tables. In the latter two cases, SQDR Plus assumes that the source and destination tables are in sync at the time of the "fail-over" or "fall-back" operation, and that only its log position is to be considered invalidated. With this option, all subscriptions will be taken offline on Startup. Any staged transactions will be marked as "rolled back" and the Log reader position will be reset. Then subscriptions will be taken online, refreshing metadata and validating that SQDR Plus has reacted to any new ALTERs or logging changes. Stop the agent by selecting it and selecting Stop Agent from the Database menu. 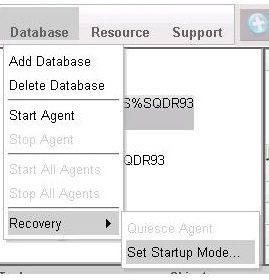 Choose Set Startup Mode from the Recovery submenu of the Database menu. The Setup Startup Mode dialog is displayed. Select the desired value.